If someone is described as “smiling, but not with their eyes,” that person is likely faking the smile. But what does that mean, exactly? And how can one tell a real grin from a fake one? New software by California-based company Emotient can do just that. 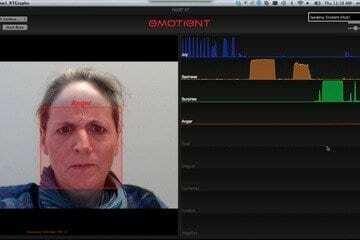 Using a simple digital camera, Emotient’s software can analyze a human face and determine whether that person is feeling joy, sadness, surprise, anger, fear, disgust, contempt or any combination of those seven emotions. “There’s often a disconnect between what people say and what people do and what people think,” said Marian Bartlett, co-founder and lead scientist at Emotient. The company’s software, called Facet, can reconnect those dots by accurately reading the emotions registering on a person’s face in a single photograph or video frame. All it needs is a resolution of at least 40 by 40 pixels. Using Facet on a video sequence produces even more interesting results, because the software can track the fluctuations and strengths of emotion over time, and even capture “microexpressions,” or little flickers of emotion that pass over people’s faces before they can control themselves or are even aware they’ve registered an emotion. “Even when somebody wants to keep a neutral face, you get microexpressions,” Bartlett told LiveScience. That’s because the human body has two different motor systems for controlling facial muscles, and the spontaneous one is slightly faster than the primary motor system, which controls deliberate motion. That means microexpressions will slip out — and as long as they appear on a single frame of video footage, Facet can recognize them, the company says. The software can also pick up on other subtle facial signs that a human might miss. In the case of “smiling, but not with your eyes,” Bartlett explained that when people smile sincerely, a muscle called the orbicularis oculi, also known as the “crow’s feet muscle,” contracts, creating the wrinkles at the eyes’ edge that are sometimes called “crow’s feet.” In these types of cases, the software does need images clearer than 40 pixels, but the required resolution is still within a common webcam’s capabilities. So, what are some uses for software that can identify human emotions based on facial expressions? Facet’s applications are incredibly far-reaching, from treating children with autism to play-testing video games. The DHS Will Use Facial Recognition on 97% Of Departing Airport Passengers In The Next 4 Years - Inc.
April 18, 2019 - US facial recognition will cover 97 percent of departing airline passengers within four years The VergeThe Department of Homeland Security says it expects to use facial recognition technology on 97 percent of departing passengers within the next four years. April 17, 2019 - Facial recognition is almost perfectly accurate — here's why that could be a problem Business InsiderFacial recognition is a powerful tool. The accuracy rate is almost perfect, especially when fed with enough data. Here's why it needs to be regulated. April 17, 2019 - Microsoft didn't want to sell its facial recognition tech to California police EngadgetWhen it comes to facial recognition, it seems Microsoft truly has been trying to do good. Company president Brad Smith has revealed that the tech giant recently. April 18, 2019 - FBI's Facial Recognition Programs Under Fire Over Privacy, Accuracy Concerns NextgovThe bureau has largely ignored the Government Accountability Office's concerns about its use of facial recognition in criminal investigations.